The great thing about frittata is that it is just as good cold as it is warm - so if you have any left overs (which we doubt) you can have an easy lunch the next day. The haloumi adds a hint of decadence to this protein packed dish, and the chili a little heat. Along with a simple salad, we think this is a midweek winner, enjoy! Preheat oven to 180°C. Peel pumpkin, discarding seeds, then cut into 1 cm cubes. Peel and mince garlic. Heat pan on medium add enough oil to cover base, add garlic, then cook for 1 minute. Add pumpkin and continue to cook until pumpkin is tender (can pierce with a fork), about 10 minutes. Pat haloumi dry on paper towel. Cut the haloumi into 8 equal sized pieces. Add oil to a non stick (ovenproof) pan over medium heat. Carefully add the haloumi and cook 3-4 minutes per side until golden. Set aside. While the pumpkin is cooking, wash the fresh produce. Slice tomatoes in half. De-seed chili (optional - you can leave the seeds if you like a bit more heat) and thinly slice. Crack eggs into a jug, add milk and whisk well with a fork. Once pumpkin is tender, pour egg mix into the pan and top with haloumi, chili (to taste) and season with salt and pepper. Put pan on the top shelf of the oven and cook for 20 minutes, until egg is set and golden brown on top. Remove from oven. (NOTE: alternatively, if you don't have an ovenproof pan, you can add everything to an ovenproof dish - that's what we did). In a bowl, combine baby spinach and rocket with tomatoes. Add vinegar and 2 TBS olive oil (extra virgin if you have it) and toss well. Season with salt and pepper. 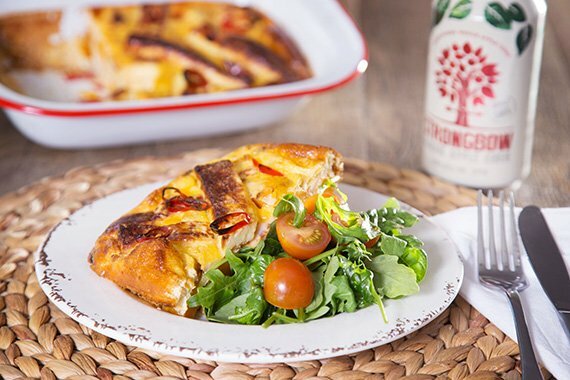 Serve frittata with salad on the side. Enjoy!